Every experienced fly fisherman has fly patterns he or she believes in and fishes with absolute confidence. Most fly tiers have, in fact, developed patterns they believe to be world-beaters at most of their favorite fishing holes, seldom using any other flies. It would be difficult, for example, to convince legendary Jim Teeny to begin a fishing trip with a fly other than his commercially successful Teeny Nymph. It is my understanding that he rarely ever uses any other fly. Jim has validated the pattern in lakes and streams worldwide. He has, in fact, booked quite a number of world records with his fly. There are other examples of highly successful fly patterns that have earned a devoted following. I know streamer fishermen who rely on the Muddler Minnow in almost all of their fishing, sinking it deep to imitate forage fish, and fishing it dry as a grasshopper. I also know a great many dry fly anglers who will tell you with great conviction that the Humpy is the only floating fly you need west of the Mississippi River. Although they would have more trouble defending that position with the Humpy, than Teeny does with his wet fly patterns. I know at least a dozen Idaho fly fishermen who will tell you if they were limited to just one fly pattern for all of their fishing, it would be the Stayner Ducktail I happen to be a charter member of this group. Just how good is the Stayner? A fishing excursion to Russia may have proved once and for all that the fly belongs in the Fly Fishing Hall of Fame. Boisean Ken Magee, the leader of a trout and salmon fishing expedition to the Zhupanovo River on the Kamchatka Peninsula in northeastern Russia, described the group's first day on the stream. "The guides showed us their fly boxes and made some pattern recommendations," Magee told a Boise Valley Fly Fishermen audience. "We thanked them and told them we would save their flies for later." "We showed them some Stayner Ducktails" Magee went on, "and they had never heard of the fly. By the end of the trip we had caught more fish with the Stayner than with all of the patterns the guides had recommended combined." Another angling friend, the late Russ Severn of Nampa, Idaho, once made a month-long trout fishing trip to New Zealand. While he purchased every local fly recommended to him when he reached the islands, he caught most of his trout on Stayner Ducktails Ken Magee had tied for his trip. Magee has even added some successful Stayner variations to his bonefish collection. Invented by the late Ruel Stayner, former Twin Falls, Idaho sporting goods store owner and master fly fisherman, the pattern has in the past 25 years become a staple of fly fishermen all over the country. The Stayner Ducktail was one of the first flies I ran when I initiated a "Fly of the Week" feature in the Boise newspaper in the early 70s. Originally designed to imitate the perch fry in Idaho's Magic Reservoir, the pattern does an even better job in suggesting shiner minnows or trout fry. Anglers should remember that almost all game fish eat other little fish. The food chain may begin with algae, copepods and daphnia, but it ends with the largest fish in a fishery eating their smaller brethern. And it's not just a trout fly. While I'll admit I catch more smallmouth bass with some type of crawdad pattern, the Stayner is usually my second choice. When I'm fishing a lake or pond that produces large bluegill (fish in the 9- to 12-inch range), my fly of choice is usually the Stayner Ducktail. Believe it or not, the pattern can also be one of the most deadly flies for channel catfish. While that may surprise some fly rodders, when anglers understand that the channel catfish's natural foods isn't kidney meat and stink baits, but crawdads, shiners, dace, chubs, and any other life forms the catfish can kill for a meal, they will imitate those aquatic trout foods when searching for channel catfish with a fly rod. Although the Stayner is used more in lakes and reservoirs than in streams, I've hooked more lunker trout in my favorite southwest Idaho blue-ribbon trout stream with the Stayner than any other single fly. When things get tough on the South Fork of the Boise, I'll put on a hi-density sink-tip fly line and fish the fly through some of the better holding areas. New fly patterns come and go. Some hang around for a few seasons, then quietly disappear. But now and then a fly comes along that not only becomes a local standard, but gains national and international prominence. The Stayner Ducktail is just such a pattern. In the beginning I tied and fished the Stayner in sizes 6 through 10. I still use those sizes when the prey base of my quarry are large minnows. But during the past three or four years, I've been experimenting with sizes 14 through 16. In most of my trout fishing I now find sizes 12 and 14 are my most productive sizes. I have a theory: I believe the smaller Stayners appeal more to trout because they represent an easier meal than do the larger sizes. As bait fish grow larger, most are faster and quicker, better equipped to elude predator fish. While this theory flies in the face of the "give big fish a mouth-full," it works for me. I believe if trout could carry on a conversation with anglers, they would probably ask for minnows they can easily capture. I've experimented with variations over the years. I suppose I've tried 10 or 12 different colors of ducktails. Most have produced only limited successes. The one variation that has survived has become more productive for me than the original. I named it my Blonde Stayner. I think it does a better job suggesting the fry of: perch, dace, suckers and chubs. Since I am a bit of a nervous fly fisher, I enjoy fishing ducktails. I fish a quick retrieve a lot of the time. In presenting ducktails to hungry fish, the angler should work his line to make his fly dart like wounded prey. Hook: Mustad 9672, or 3X long equivalent. Sizes 6 - 14. 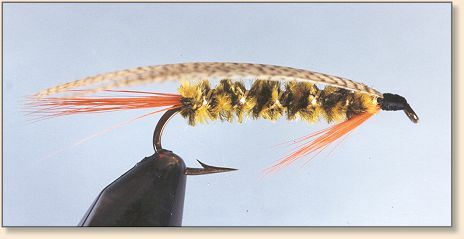 Tail: 10 or 15 orange saddle hackle fibers, � body length. Body: Dark-olive chenille, sizes medium or small. Ribbing: Gold 16/18 mylar tinsel, 4 or 5 wraps. Beard: 10 or 15 orange saddle hackle fibers, reaching to hook point. Wing: Natural mallard flank feather, tied flat, reaching to end of tail. And here is my favorite, the Blonde Stayner. Hook: Mustad 9672, or 3XL equivalent. Sizes 6 - 14. Tail: 10 to 15 orange saddle hackle fibers, 12; body length. Body: Yellow and dark olive variegated chenille, sizes medium or small. Ribbing:	Gold 16/18 mylar tinsel 4 or 5 wraps. Beard: 10 to 15 orange saddle hackle fibers, reaching to hook point. Wing: Woodduck dyed mallard flank feather, tied flat, reaching to end of tail. 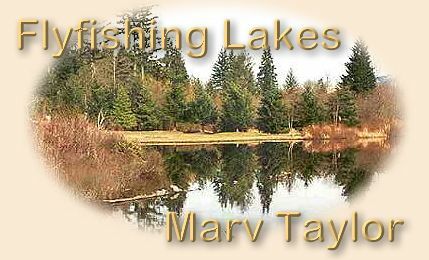 Marv Taylor's books, Float-Tubing The West, The Successful Angler's Journal, More Fragments of the Puzzle, (Volume I) and More Fragments of the Puzzle, (Volume II) are all available from Marv. You can reach Marv by email at marvtroutman@juno.com or by phone: 208-322-5760. If you would like to comment on this or any other article please feel free to post your views on the FAOL Bulletin Board!